Witch hazel (scientific name Hamamelis virginiana) is a flowering plant known for its various health benefits. In North America, it is also called Tobacco Wood, Spotted Alder, Snapping Hazel or Winterbloom. Witch hazel extract has antiseptic, antiviral, anti-inflammatory, and antibacterial qualities. Its natural components (gallic acid, tannins, oils, resin, and flavonoids) give witch hazel these unique properties. All these ingredients in witch hazel make it a great remedy for many health conditions. Witch hazel is frequently used to treat skin conditions including burns, skin irritation, boils, acne, blemishes, bruises, minor cuts, stings and insect bites, dermatitis, poison ivy, eczema, clogged pores, dry and cracked hands and feet, foot and nail infections, wrinkles , and cold sores. Witch hazel’s anti-aging properties and antioxidants also help prevent wrinkles, UV damage, and other signs of aging. Witch hazel is often used to make skin astringents, ointments, soaps, aftershave lotions, and bath gels. Witch hazel oil or extract is applied directly to the affected skin, or it can be diluted with isopropyl alcohol, arnica oil, water, or olive oil. Avoid applying witch hazel to open wounds. Witch hazel’s antiseptic, astringent, and anti-inflammatory properties may help heal painful, inflamed throats and gums. A simple remedy for sore throats, laryngitis, and gingivitis is witch hazel tea, made by boiling 1 cup of water and a spoon of witch hazel for 10 minutes. An alternative is to mix 1 cup of lukewarm water, 1 teaspoon of witch hazel extracts, and 2 to 3 drops of clove oil to make a gargle/mouth wash.
By combining with certain herbs, witch hazel can be an effective treatment for stomach flu, diarrhea, colitis, dysentery, irritable bowel syndrome, and other gastrointestinal ailments. To relieve uncomfortable symptoms, make an herbal tea using 1 teaspoon of mint, chamomile, thyme, and witch hazel in one quart of water. Bring to a boil, then let simmer for approximately 5 minutes. Pour one cup of tea and sip throughout your day and refrigerate the remainder. Witch hazel contains tannins, flavonoids, and other compounds that may assist in healing and constricting the inflamed and injured blood vessels that result from hemorrhoids. Simply take 1 teaspoon of witch hazel extracts, and brew it via boiling in a cup of water for 15 to 20 minutes, then you can enjoy a cup of witch hazel tea. After a bowel movement and before bed, dab cotton balls, gauze squares, or clean cotton cloth into the tea and put it to the affected area for 2-3 minutes, then repeat this process for 10 to 15 minutes using a fresh compress. Regular and repeated treatment should allow witch hazel’s antibacterial and anti-inflammatory properties to help decrease the swelling and discomfort. Witch hazel can help soothe and heal the perineal area after tearing or an episiotomy while giving birth. Simply apply several drops of witch hazel extract onto a clean feminine pad before placing it into your undergarment. Alternately, you can place 5-6 drops of witch hazel oil into a squirt bottle full of warm water and use this solution to cleanse the perineum after urinating or defecating. Some studies have shown that witch hazel’s polyphenols and other components may be effective in the treatment of varicose veins. Simply make a solution of 1 cup lukewarm water mixed with 10 to 15 drops of witch hazel oil. Soak a clean cloth in this solution, and then apply it like a compress to the affected veins. Allow the affected veins to soak under the compress for 10-15 minutes while keeping the legs straight and elevated. Witch hazel assists in the control of bleeding and can be used topically for wounds or internally for bleeding ulcers or bleeding gums. Naturally, serious wounds or excessive bleeding require medical intervention, but witch hazel can be useful for minor cuts and scrapes. Witch hazel helps to dry the secretions caused by swimmer’s ear, which is associated with moisture and pus in the outer ear canal. Simply dip a cotton swab into a tea of witch hazel, goldenseal, and calendula and apply it to the outer ear. Used topically, witch hazel oil helps treat bruises, sprains, and painful, swollen joints. At night, place several drops of witch hazel oil onto a strip of cotton cloth and apply it loosely around the affected area. Witch hazel has long been used to prevent and treat diaper rash. Simply apply witch hazel oil or diluted tea of witch hazel to the affected area during diaper changes. 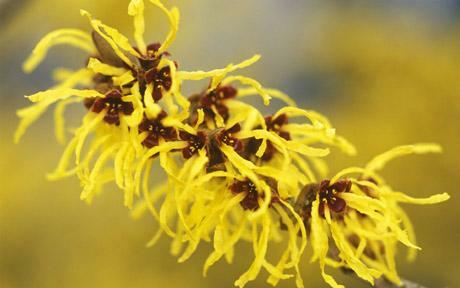 There are many usage forms for witch hazel, including a tincture, a tea, and a lotion. The dosage for a tincture is 1/8-1/2 teaspoon, taken 2-6 times per day. Witch hazel tea can be consumed as needed several times a day, but limit consumption to several weeks. Witch hazel can also be applied topically in lotion form. Simply cut its bark into small chunks and place in a blender with enough vodka to cover the bark and the blender blades. Chop as finely as possible, and then transfer the mixture to a glass jar. Shake the jar vigorously daily for 5-6 weeks, then strain. Combine 1 ounce of this preparation with ½ ounce aloe vera gel and ½ ounce vitamin E oil, then bottle to make a supply of lotion. Witch hazel has been approved by the FDA as an herb for medicinal use. There are no known side effects from using witch hazel. However, there is a risk of allergic reaction with an oral overdose. Symptoms include rash, itching, inflammation, difficulty dizziness, breathing, upset stomach and/or nausea. As a result, oral consumption of witch hazel should only take place under the supervision of a healthcare provider. If you experience any of the above-listed symptoms, go see your doctor immediately. Do not use commercial witch hazel internally if they contain isopropyl alcohol, due to risk of poisoning. Though there is no definitive information about the safety of using witch hazel during pregnancy and while breast feeding, it is best for pregnant and nursing women to avoid its use or consult their physicians before using it. You can easily purchase witch hazel at drug stores, pharmacies, grocery stores, or health food stores. Read the label on the package carefully, as witch hazel is sold in separate formulas for internal and external use. Witch hazel for topical use often includes isopropyl alcohol as an additional ingredient. If purchasing for facial use, look for organic witch hazel gel, which has a mild formula and is better for sensitive skin.